Upholstered furnishings in your home must last for several months or years, in that time span they must also endure non-stop heavy use. With time, your upholstered furniture will accumulate a significant amount of soil and dirt, which will become easily noticeable. Similar to carpeting, dirt and dust can easily become embedded within the fibers of your upholstery, causing your upholstered furnishings and fabric materials to become faded, lose color, and result in a loss of durability. 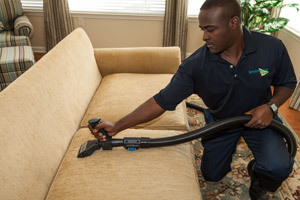 For Houston upholstery cleaning services, ServiceMaster Advantage is the specialist you can trust. When you want your furniture and upholstered items to appear like new and rejuvenated in color and brightness, there’s no one better than ServiceMaster Advantage to care for upholstery. We’ll clean your upholstered furniture in a safe and effective manner to remove soil, stains, and dirt, while also helping reduce or minimize allergens and dust within your home. When partnering with ServiceMaster Advantage for Houston upholstery or fabric furniture cleaning services, our professionally trained and experienced cleaning technicians will treat your items with the utmost respect and care. With our specially designed techniques and state-of-the-art equipment, your upholstered materials will receive a deep cleaning that will restore colors and help prolong the durability and life of your upholstered furnishings. For more details or to schedule an upholstery cleaning service, call the ServiceMaster Advantage office today!